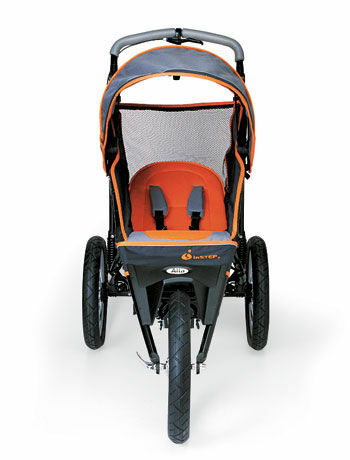 Jogging strollers give avid runners the freedom to get in serious workouts, even if they are on baby duty. Jogging strollers give avid runners the freedom to get in serious workouts, even if they are on baby duty. (Spouses of serious runners also can get some much-needed alone time!) Run-ready strollers differ from everyday strollers in a variety of ways--the two most important having to do with the wheels: All jogging strollers have 16- or 20-inch wheels to keep up with a running pace; they also all have a fixed front wheel, as swivel wheels are appropriate only for walking or errand running, not for real running. A final--and noteworthy--difference: The majority of jogging strollers aren't suitable for infants. Your baby needs to be able to hold up his head easily before you take him running--for most babies, that means waiting until he's 4 to 6 months old. However, a few companies, including Baby Jogger, BOB, Chariot and Dreamer Design, sell infant adapters that cost $35 to $60. Down the road, you can run with your child until he is well into elementary school, as all the joggers pictured below (except the InStep, which has a weight limit of 50 pounds) accommodate a child from 70 to 80 pounds.